At the 1st Asian Conference on Biocultural Diversity held in October 2016 in Nanao Ishikawa, the participants mutually recognized that local wisdom about sustainable use of natural resources and biological diversity are strongly linked. During this conference, we discussed policies to realize societies that coexist with nature by utilizing diverse natural and cultural resources of local communities. The Ishikawa Declaration, which states various approaches taken by national and local authorities, international society, and the academic community, at their own level, to support the sustainability of local communities, was adopted at this conference. To commemorate the one-year anniversary of the 1st Asian Conference on Biocultural Diversity, we will explore the measurements to further promote the Ishikawa Declaration with international initiatives and East Asian partner. The first forum is being held to coincide with the Ishikawa meeting of Steering Committee of the International Partnership for the Satoyama Initiative (IPSI). 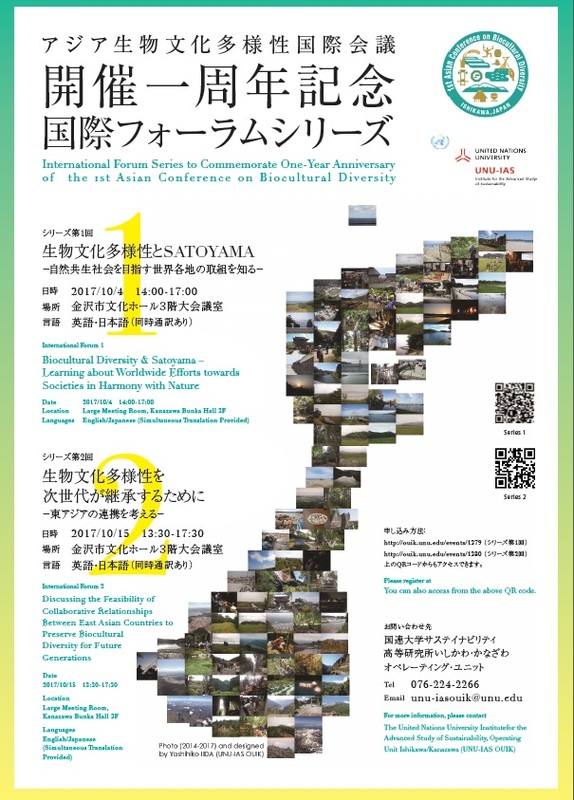 In this forum, we will discuss how the world learns and puts into practice the concept of the Satoyama Initiative, which is based on the philosophy of “coexistence with nature”. We will also discuss how the linkage of biological and cultural diversity is related with the livelihoods of global local communities in Satoyama and Satoumi region.